PUNE: Abundant production and attractive pricing are likely to make the premium quality roses grown in Pune a Valentine's Day darling across the world. Painting a rosy picture, flower growers said they are expecting between 40% and 100% rise in rose exports over last year. Flower growers claimed that their roses are in huge demand in Europe, the Middle East as well as the Far East. Reasons: in terms of quality they are on a par with the roses produced in the African countries and when it comes to pricing, they are much cheaper. "Export-quality roses are primarily grown in Pune district's Maval taluka, a hub of India's export-oriented floriculture industry. Growers from the Pune region are expected to export around 6-8 million flowers before Valentine's Day," said Praveen Sharma, the president of Indian Society of Floriculture Professionals. Last year, Sharma said, the total exports from India in February was US$ 3million (approximately Rs 20 crore). "Looking at the export trends, this year the growers may reel in $3.3 million. Most of the flowers are headed to the UK, which accounts for more than 35% of Indian flower exports. Next in the line are Australia and Japan with 19% and 18% export share of Indian flowers, respectively," he said. Jay Bheda, the director of Horizon Flora Pvt Ltd, a rose growing and export firm in Maval, said, "We have witnessed a 100% increase in rose exports this season as the conducive weather has helped us produce better quality roses. The demand, this season, has been high from Europe, the Middle East, Japan and Australia." Jaysingh Hulawale, a rose grower from Khed, said he had seen a 40% spike in Valentine's Day-related demand for his roses from Europe and 10% from the US. "Indian roses are available at much cheaper prices than what Europe can get from other top rose producers like Kenya, Ethiopia and Tanzania. This is why there is a surge in demand for us," he said. Last year, Hulawale's farm had produced 70% exportable roses, while this year the figure has jumped to 90%. Thanks to favourable weather conditions, the Pune region has seen a bumper production of good quality roses this year. Production of the exportable roses begins by January. By the first week of February, the growers are ready to harvest their produce. Most of the rose exports take place in February, specifically between February 1 and 10, to cash in on the Valentine's Day demand. Most of the exports are from either Mumbai or the Bengaluru airports. Mumbai accounts for more than 60% of the shipments during the Valentine's Day period. Many special orders have also been placed from countries like Singapore, Malaysia, Lebanon and Saudi Arabia. Growers said the rose prices in the domestic retail market are also expected to go up. 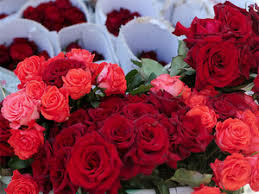 While a bunch of 20 roses was available for about Rs 160-180 last Valentine's Day, lovers this year should be ready to pay Rs 200-220 for a bunch of red roses.